Welcome to the sixth expansion to Klaus Teuber's ~Catan Card Game! Here you'll find 40 new cards telling of bloodthirsty barbarians who can raid your lands, and high-powered merchants to lead you to prosperity. This box also contains 50 revised cards from the first 5 expansions, as well as all the latest rules updates, so you can use your old cards with the current game. 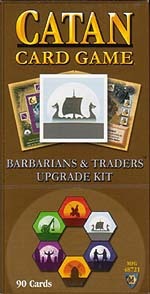 Like all Catan Card Game Theme Sets, you need a copy of the basic game to use the Barbarians & Traders expansion or the other upgrade kit cards.